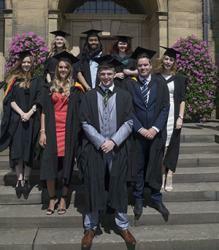 On Friday 17th July 2015 twelve Bangor University students will be the first to graduate from the pioneering BMedSci Medical Sciences programme developed by the School of Medical Sciences, the University’s youngest academic department. These student have set an extremely high bar for future cohorts to follow with over 50% graduating with a 1st class degree. The Medical Sciences degree provides a science programme related to medicine with strong professional skills/ethics and research elements and the graduates are hoping to go onto a number of destinations including paramedic training, masters degrees and several who have applied for graduate entry to medicine programmes at a number of different UK and EU medical schools. Praise Eguare, a 3rd Year graduating student said "I'd say that my experience at the School of Medical Sciences has been academically challenging yet very rewarding. I have thoroughly enjoyed my time here at the School of Medical Sciences and Bangor University and hope to go on to study medicine. I feel that this BMedSci degree which consisted of a range of interesting, medically oriented modules gives me an ideal platform. I have particularly enjoyed the research involved in the final year dissertation module." These students will benefit from graduating from a School that is the focal point for medical education and research at Bangor University. There has been substantial growth in the size of the School in the last three years now to a Faculty of over 25 and over 200 students on four undergraduate programmes including the IBMS accredited BSc Biomedical Science, which is ranked No.1 in the UK for ‘student satisfaction’ in the 2014 National Student Survey. The School also offers postgraduate courses in Clinical Sciences and Medical Molecular Biology with Genetics. It has a growing research base which is building on the University’s success in the Research Exercise Framework 2014, with cutting edge researchers in topics including stem cell biology and DNA repair complementing the existing clinical expertise. Further, Professor Nichola Callow, Dean of the College of Health and Behavioural Sciences stated: “this is a fantastic achievement for the School and we are very proud of the students and staff. It provides a fantastic foundation for continued development and success in the future." Bangor University’s Vice Chancellor, Prof John G Hughes commented "The University is committed to improving the quality and quantity of medically related teaching and research. The first cohort of Medical Sciences graduates is another milestone along a path that will have a real impact on medical provision in North Wales."